It's very thick, and knits up very rapidly. 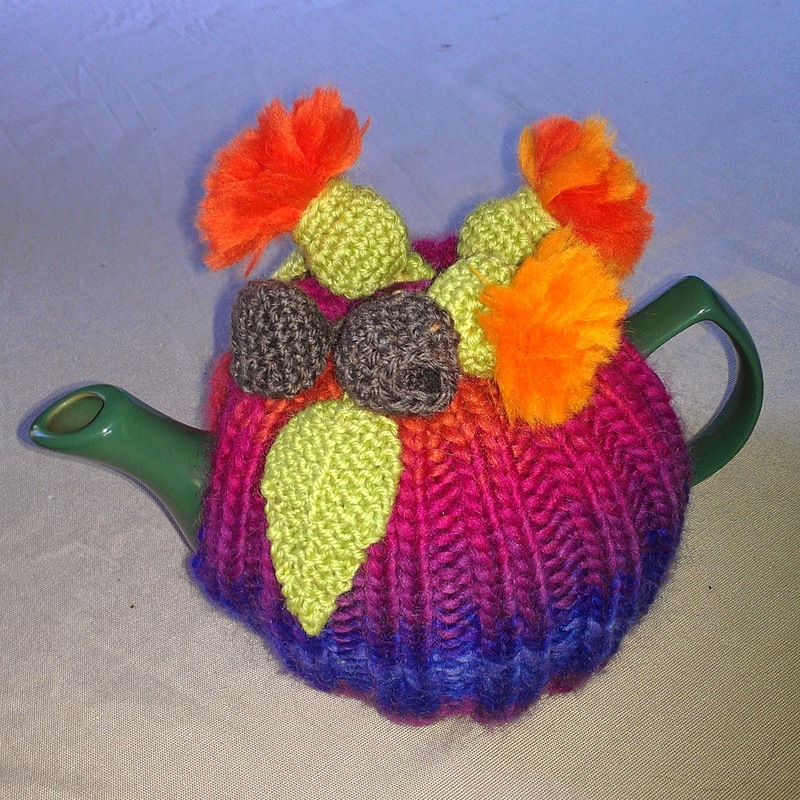 This tea cosy fits a 4 cup teapot. The body of the cosy uses just a little more than 1 ball of Jester, the flowers are also the same yarn: I've used two different colours for them. Using a pair of 6.5 mm needles, and Jester yarn, cast on 28 stitches, and knit in k2, P2 rib for 13 cm. (K2, P2 tog), repeat to the end of the row. Next row, (K1, P2); repeat to the end of the row. Next row, (K2, P1), repeat to the end of the row. 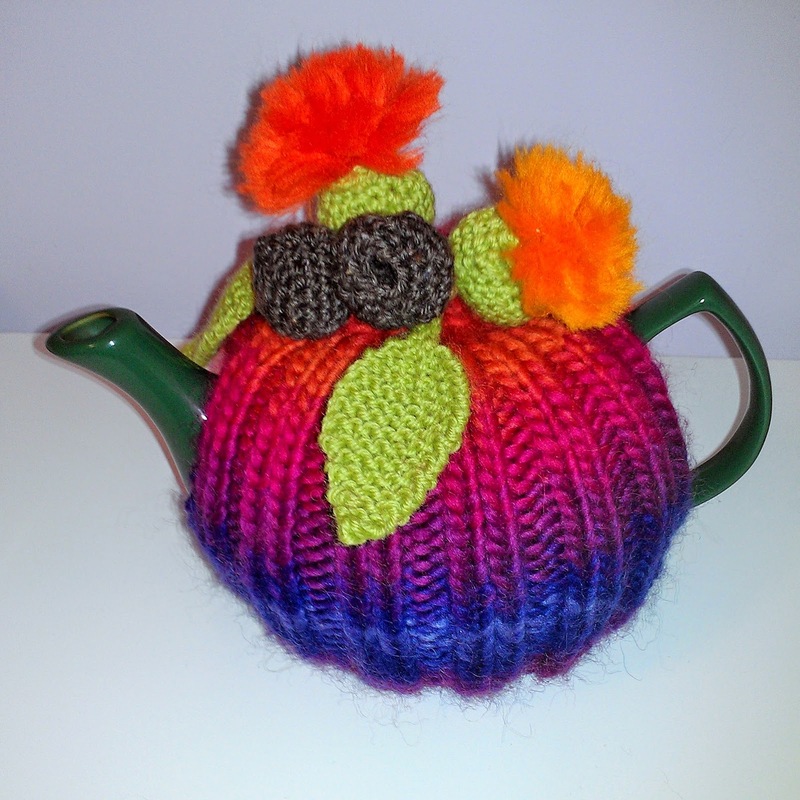 Knit another piece the same; stitch together leaving enough space for the handle and spout of the teapot. Using a 3.5mm crochet hook, and some 8 ply brown yarn, crochet 4 chain; ss into 1st chain to form a ring. 1 ch, 10 dc into ring; join with a ss into 1st dc. 1 ch, 1 dc into same place as ss, (2 dc in next st, 1 dc in next stitch) rep to last stitch, 2 dc in last stitch. (15 stitches). Work 2 more rounds of dc without increasing. Decrease every 3rd stitch in the next round (10 stitches). Fasten off. In green yarn, work as above for the gum nuts; don't fasten off. Work one more row, increasing to 15 stitches. Fasten off. To make the stamens, cut 14 pieces of the Jester yarn, 15 cm each. Make into a bundle. With a 30 cm length of a reasonably strong yarn (8 ply is ok), tie around the centre of the bundle firmly. Now, letting the 8 ply hang freely, tie a single knot with the bundle of Jester. Using the attached 8 ply yarn, pull the knotted bundle firmly down into the green gum nut. The ends will fluff out as in the photo, and the 8 ply yarn can be pulled through the starting ring of the green gum nut, and be used to secure the flower to the top of the tea cosy. The knot of the thick yarn acts as a filler for the gum nut. Trim the flower with scissors as necessary. Using green 8 ply yarn and 4 mm double pointed needles, cast on 3 stitches, and work an I-cord for 4cm for the stem. Continue as follows for the leaf. Row 2 and each alternate row, knit. Next, decrease 1 stitch in the middle of the 15th row and every alternate row until 3 stitches remain. Work 2 rows without shaping. Next row, slip 2 knitwise, K1, pass the 2 slip stitches over. Fasten off. Make 2. Sew the end of the stems on to the bases of the flowers, and attach with the brown gum nuts to the top of the cosy.